Please note: All our kits will be sold via The Curious Electric Company from now on. This page is for information only. Please visit our shop to see our current range of kits or contact us to discuss your project and how we might be able to help. This is a K-type (or J-Type) thermocouple amplifier which can be used to amplify the tiny voltage from a thermocouple to a higher voltage, readable by a microcontroller. Thermocouples can be used to measure very high temperatures, but they only output a very low voltage, hence the need for this amplifier. 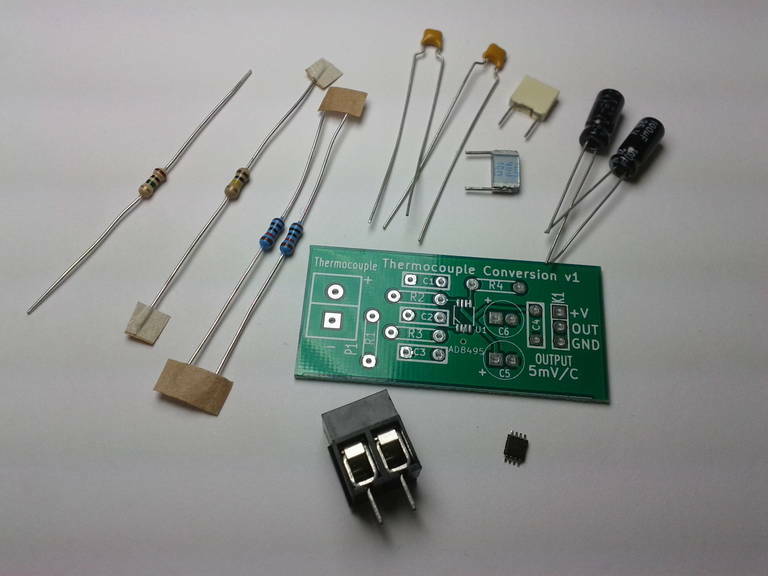 This kit is based upon the AD8495 precision K-type thermocouple amplifier, or the AD8494 J-type version. The board requires a 5V supply and gives a linear output of 5mV per degree C. The circuit board contains filtering for the standard amplifier configuration. It can be used to measure temperatures up to 1000C. Please Note: This page is for reference only. Please see here for the most up to date information. I had designed and built a temperature controller for a reflow soldering oven which used this thermocouple amplifier. A couple of people asked me about this circuit so I decided to quickly make a simple breakout PCB. This converter can be used anywhere you need to measure high temperatures – such as soldering temperatures, flue and exhaust gas temperatures, BBQs and ovens. Below 100C I would generally use a thermistor, but not many thermistors are rated for temperatures above 150C. In that case we need to use a thermocouple which output a tiny voltage. This must be amplified and filtered so that it can be read by the ADC in a micrcontroller. This kit is available here. The cost is £10 (including p&p within the UK), or slightly more for Europe and worldwide. Note: You will need: soldering iron, solder, wire cutters. The PCB and schematic for this project were drawn using the open-source KiCAD electronics design package. 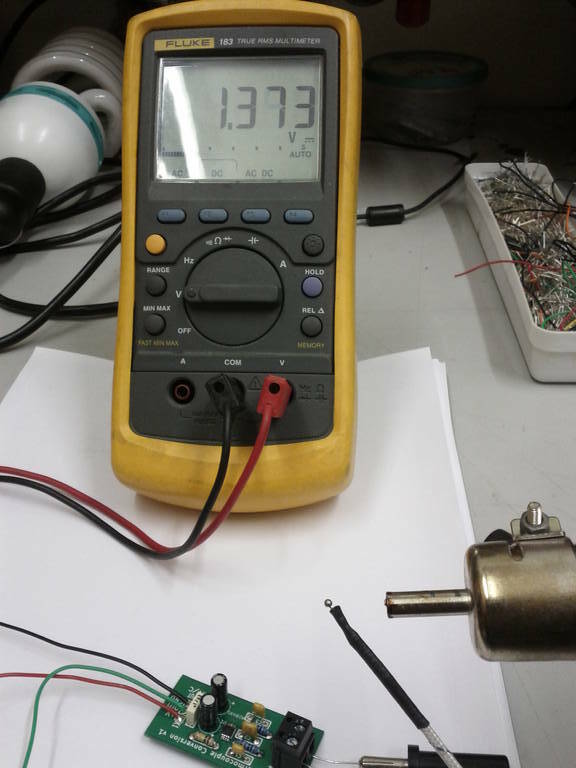 The output voltage is 1.373V, which equates to 1.373V / 5mV = 274C. This could be easily read by the ADC in a microcontroller. what modifications to the above circuit is required in order to measure negative temperatures using a J-type thermocouple. Quoting Dele: what modifications to the above circuit is required in order to measure negative temperatures using a J-type thermocouple. Apparently, to measure negative temperatures you need to apply a higher voltage to vref than to the negative supply. This offsets the output and allows it to go negative with the same 5mV per degree. With this design I have not made it very easy to do this. I have connected vref and the negative supply. This small track will need to be cut and then a known reference voltage applied to Vref. I’d suggest using a 2.5v reference which would give a maximum output of +500 degrees to – 500 degrees (lower than physically possible…). Maybe a 1v reference could be used. Thanks for asking- with this revision of the PCB it will be difficult to do, but not impossible. With the next revision I will make this easier to do. Maybe you can help me. I looking for a thermocouple amplifier to RTD temperature sensor (RTD100) with three wires. I have an Arduino Uno and try to keep temperature data with a sensor RTD100. Thank you and I’m sorry with my English. Maybe you can help me with my problem. I need to have a thermocouple amplifier to a RTD temperature sensor (RTD100) with three wires. I have an Arduino One which I want to keep temperature data obtained with the RTD100 sensor. An RTD is a different device to a thermocouple. An RTD has a resistance which changes with temperature, a thermocouple generates a tiny voltage when one side is at a different temperature to another junction. I have used RTDs before and did this by supplying a small but accurate constant current. This means the voltage will be proportional to the temperature (V = I x R and the I is constant). This has the reference circuit for supplying 1mA for RTDs , which I used. Hi Paul, Yes – this would read exhaust gas temperatures (up to 1000C with the right thermocouple), but the output is a voltage from 0-5V. You would need to conenct that into he management system (not sure how that works – probably a CAN bus system?). This kit is more for developing microcontroller applications. Regards, Matt.